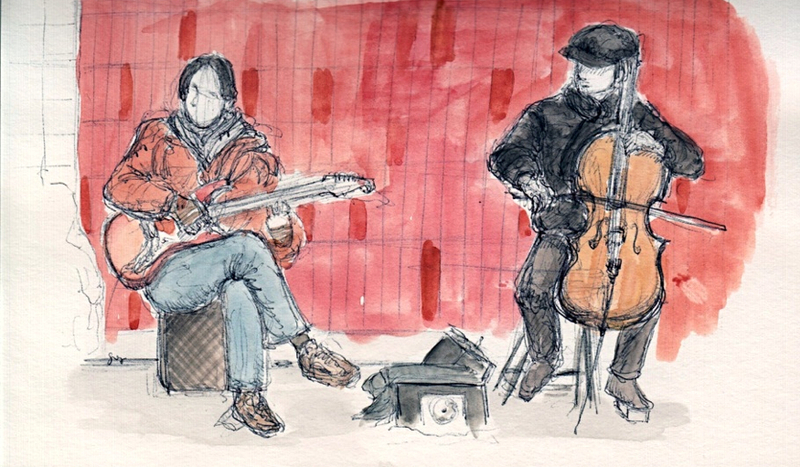 I was contemplating new themes for a urban sketchbook and came up with "Toronto Subway Musicians". I've seen and heard a couple of them and find they are such a great asset to the city and to people's daily commute. My goal is to draw all of them this year while they are performing in the subway. This should be fun. I did a little bit of research and found out that the musicians are professionals, selected every three year by TTC to perform in various subway stations. I'm currently looking for the list of selected musicians and their location so that I can sketch them all. Unfortunately, I could not find that information on the TTC website. It's too bad because I imagine this would also be beneficial to the musicians. Something like the Music Under New York (MUNY) website would be nice. Anyway, I sent out in a request and I hope to hear from them soon. In the mean time, I started with these two guys at Eglinton Station, one was playing the electric guitar and the other one was playing the cello. They were really good and created a really nice atmosphere.